This article first appeared at American Lens News on November 1, 2017. Last week the Washington Post reported that Marc Elias of the Perkins-Coie law firm was the same person who commissioned and disseminated the now infamous Russian dossier on President Trump compiled by Fusion GPS. After indictments were handed down on Paul Manafort and his associate John Gates, we have the Podestas on the run. John Podesta’s brother, Tony Podesta, has folded up his shop in wake of the Mueller indictments. Meanwhile, the media has pivoted to a low-level staffer named Papadopolous, who might have worn a wire for the FBI, in hopes of salvaging their nearly year-long Russia collusion narratives. All those cries of ‘Russian interference’. All the collusion claims. Looks like the Russian dossier and the ‘fight against Trump’ themes have boomeranged on Clinton, Elias and the Democrats. But what most people don’t know is that Perkins Coie and Elias have also been fighting to throw-out NC’s congressional and state legislative districts. Further complicating the matter is the fact that that this is the same firm that challenged NC’s Voter Id law. To make things even more sketchy, around that same time Elias was Governor Roy Cooper’s attorney. What remains to be seen is if those same tactics, resources, or sources of money were used to influence North Carolina’s legislative districts and gubernatorial voting challenges in 2015 and 2016. In addition to being the funding middleman for the Russian dossier and sitting next to John Podesta while Podesta denied knowledge of said dossier, Elias was once Candidate Cooper’s lawyer. Roy Cooper issued a press release on November 11, 2016, stating that Cooper had hired Marc Elias and the Perkins-Coie firm to represent him in the vote challenges and final election certification in 2016. Cooper’s other representation was NC Attorney Edwin Speas of Poyner Spruill, LLP. On election night in 2016 as the polls were closed, the vote margin between Attorney General Cooper and Governor Pat McCrory was less than 1%. But, through legal wrangling, voter challenges, and challenges surrounding vote machine errors, Elias won the day for Cooper. Elias did all this without batting an eye at his own hypocrisy. While he was fighting a recount in NC for Cooper, he was screaming for one for Hillary Clinton in Wisconsin. Elias and his Perkins-Coie firm have outmaneuvered Republicans and other conservative groups at just about every legal issue over the last decade. At only 49 years old, Elias and his firm have racked-up an impressive number of historic victories for Democrats. From challenging NC’s voter identification laws to alleging racial bias in redistricting and fighting vote tallies, Perkins-Coie has had a significant ‘win’ ratio. However, wins such as these do not mean that Elias and team have always been on the right side of the law. Given the recent news about a $9 million payment for the Russian dossier being facilitated by Marc Elias on behalf of the DNC and Clinton campaign, it’s more than ironic that the issues of Russian meddling in the 2016 election were saddled on Donald Trump. The Clinton campaign, via John Podesta and other Democrat operatives, got out in front of Clinton’s historic loss with the ‘it was the Russians’ narrative. The media almost literally covered nothing else despite a continued lack of evidence that Donald Trump was involved at all. Suddenly, social media was to blame. Russians were manipulating groups and voters with ad buys. This was meddling in our elections. But remember, Elias was for meddling before he was against it. In 2011, Elias fought to exempt Facebook’s advertisements from Federal Elections Commission reporting. Perhaps not surprisingly, these very same types of ads are the very same ones that Facebook and the Clinton Campaign had alleged were placed by Russian run accounts and had been targeting groups supportive of Clinton like Black Lives Matter and it’s various offshoots. Facebook later reported that Russian GRU Units bought ads that targeted Donald Trump supporters, Hillary Clinton supporters, and Black Lives Matters supporters to cause division within the country. As we reported back in January, this is what enemy nations do in elections; to think otherwise would be naïve. Sometimes even nations who are supposed to be friendly do this to one another, as was evidenced by the Obama administration’s meddling into the election of Israeli Prime Minister, Benjamin Netanyahu. Progressive activist and multi-billionaire George Soros is a heavy supporter of the Perkins Coie team. His philanthropic groups have paid tens of millions of dollars to the firm to challenge conservative policies, and sometimes to directly challenge republicans themselves. Soros’ organizations regularly hire or pay for the Perkins-Coie team for services not involving their organization but to support the organization’s goals. Soros and his multiple foundations are also linked tangentially to the Uranium One deal. This connection is something that appears to be central to Congress’s investigation into allegations that Russians ‘paid-to-play’ with the Clintons. Soros has aligned with the Ploughshares Fund and the Peace and Security Founder’s Group (PASF), organizations that funded grants that appear to be linked with both the controversial Iran Nuclear Program and the Uranium One deal under former President Obama’s tenure. Most recently, Soros donated what is likely to be a world record single cash injection, $18 billion dollars, to his political endeavors. This is an enormous cash transfer by any standard and it is bound to have an effect on local and national politics. Soros is no stranger to North Carolina Politics. He has invested millions in the state, giving money to voter turn out drives, efforts to fight voter ID laws, and has been a big supporter of anti-policing efforts and bail funds to protesters. Soros linked groups have committed more than $2 million dollars in both North Carolina and in Texas for “Social Justice” efforts. 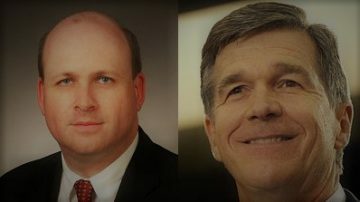 As events play out over the next few weeks and month, it is worth watching to see if the gathering storm on Perkins-Coie and Marc Elias will have any effect on Governor Cooper. We will continue our reporting on the facts in the coming months as the Russian Influence probe widens. Stay with American Lens as we continue to report on facts that traditional media outlets omit and ignore. This entry was posted in Am Lens, ELECTIONS, Pat McCrory, POLITICS NC, Roy Cooper, Voter ID and tagged Fusion GPS, Marc Elias, Redistricting, Roy Cooper. Bookmark the permalink.